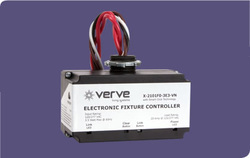 The Verve® Single Channel Controller can be used to wirelessly control electrical loads of up to 1800 watts. 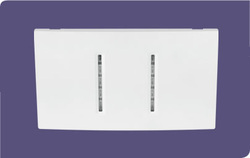 The controller installs in minutes and can be easily programmed to enable a wide variety of wireless control functions. Simply hardwire it to line voltage, mount it to the outside of the junction box, and then link it to other Verve sensors and control products for convenient wireless control and on/off switching of traditional lighting fixtures, ceiling fans and receptacles. Features Communicates wirelessly with other Verve devices using EnOcean radio frequency technology. 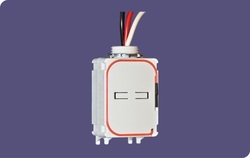 Enables on/off switching of lights, ceiling fans and receptacles. Easily links to Verve rocker pads, switches and sensors. Versatile, single point control for higher wattage applications. Controls up to 1800 watts. energy use for lighting and miscellaneous electrical loads. 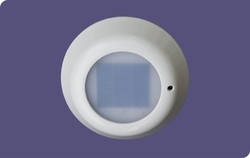 The Verve® Lumen Sensor can be used in conjunction with many Verve control products to help manage artificial light levels in a wide variety of interior spaces. The sensor monitors light levels within a space and transmits the information to a Verve controller that has been preconfigured with lighting set points to achieve the lighting levels you desire within the space. The controller compares the information to the preconfigured set points, determining whether more or less artificial lighting is required and adjusting light levels accordingly. 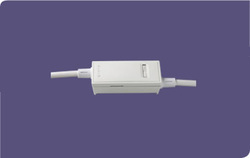 The lumen sensor is wireless and can be installed in minutes because there are no additional wires to run. They require no batteries so on-going maintenance costs are eliminated. Communicates wirelessly with other Verve devices using EnOcean radio frequency technology.Integrated solar cell enables ambient solar harvesting to power the device and eliminates the need for wires or batteries .Photo sensor maximizes efficiency in a variety of room settings and configurations.Works in conjunction with a controller to enable all-on, all-off and dimming of lighting Capable of operating in low light conditions.